This is the first entry in our Tech Type series where we explore the technical aspects of our products. First up a brief introduction to the machinery we use in manufacturing. Here at Nock Corporation, we are not afraid of technology. The fact that we design all of our patterns digitally is nothing special but having the ability to use a CNC cutting machine really sets us apart. Many other divisions of soft goods still utilize a giant jig saw that cuts up to 50 layers of fabric at a time and probably cut out some item of clothing you are wearing right now. The operators of these devices are highly skilled, or thumbless. Using the CNC machine keeps all of our cuts consistent and efficient. This is part of the reason we can stay competitive with imported goods. We start by creating the digital pattern and then nesting and plotting out a cut sheet. This is done by selecting the pattern pieces that will be cut and playing a game of Tetris. We are able to greatly minimize waste by doing this effectively. After our cut sheet is created we lay out our material, turn on the vacuum to hold the raw material in place, press go, and watch as a rotary blade cuts out our product pieces. For assembly we use a number of sewing machines and jigs that help maintain a high quality product. For general assembly we use a Juki walking foot machine. A walking foot sewing machine is different than a standard home/domestic machine because it doesn’t just feed from the underside of the fabric (those teeth are called feed dogs). The mechanism above the fabric where the needle is located has a set of feet, instead of one, that alternate contact with the material. This alternating/walking action allows for more and equal pressure to the material to provide less slipping of the different layers of fabric. A standard presser foot can create bunching due to it creating uneven friction between the top and lower layers of fabric depending on the operators skill. We do use a 1970’s Singer presser foot machine for sample making, some assembly process, and binding operations. 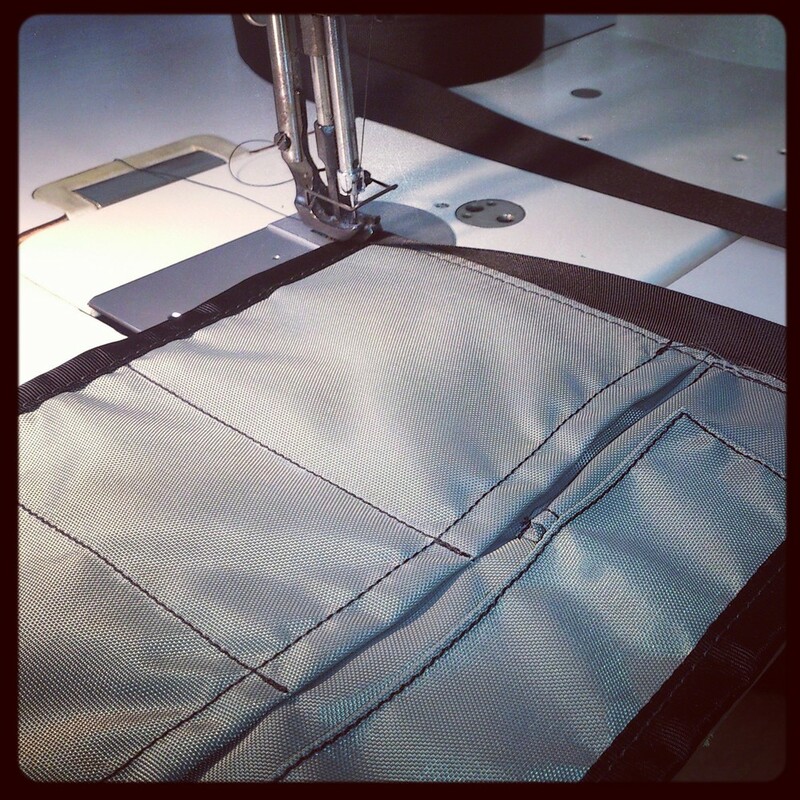 The binding that can be found on some of our products is attached with a simple jig. This jig folds the binding in half to create an even amount of binding on both sides of the products. It’s not highly technical but it is a great time saver and really improves consistency. For the divisions between pens and notepads we will be using a bar tacker sewing machine. A bar tacker creates the stitch that adheres belt loops to jeans and many mass produced khakis (dress pants try to avoid top-stitching details oftentimes). The bar tacker is set to a certain number of stitches and length. Upon pressing the pedal it will go through a series of zigzag stitching and straight lock-stitch to create a lasting, mil-spec, top-stitch. What does all of this mean to you? It means you get to use some of the best designed and crafted cases around. Next up, we will be going through the process of creating a product for sale and our Nock Co. workflow.